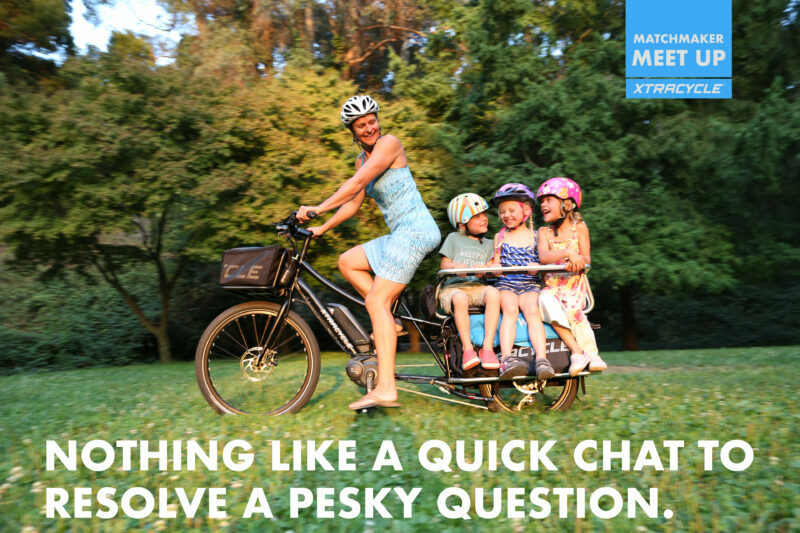 After twenty years in this business, we know that there are a few questions that tend to hold people back from fulfilling their desire to enjoy a bicycle lifestyle (which can be as simple as eliminating the crazy-making ritual of sitting in the daily school drop-off traffic). Our commitment as a company is to help empower people and transform lives. And the process often begins by resolving any doubts or confusion to get you to a place of clarity and confidence in the bike you need. For many people, we recommend starting by taking our fun little Guided Bike Recommender. However, you are completely encouraged to set up a Meet-Up at any stage in your journey (post purchase, etc). For anyone who has taken the survey, we highly recommend following up with a call to help you understand and fit-check your results. If you like, at the end of the call, we can send you a further personalized report with all the details as well as a special gift. Please click below to set up your 15-minute meeting over the phone with one of our experts at your convenience.